Due to popular demand, the 2014 Bean're calendar is now here. 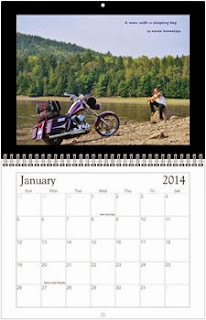 This is a quality calendar made with premium card stock and not just flimsy paper. It also has Bean're-isms written on the pictures and includes dates of the bike rallies and other events that I will be attending. I've made these in limited numbers and they are to help me raise money for my motorcycle tour of Asia and the publishing of my next book. First come first serve till they run out. I can mail them to your address around Thanksgiving so that you should have them by the first week in Dec. I will cover the cost of Shipping ( to the US only). To get a Bean're Calendar just click on the "calendar" button on my donation page. LUV! I twattle a tweet for you!